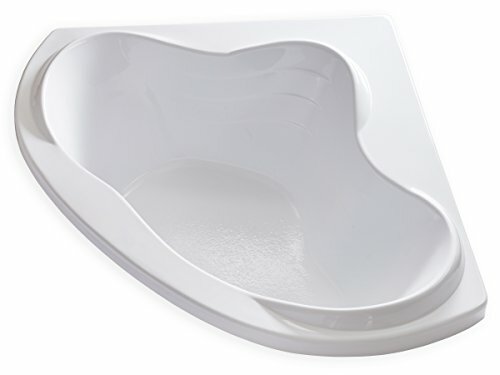 Carver drop in tubs are re known for their ease of installation and hydro features. Great for limited and corner spaces. The latest collections of hydrotherapy healing Carver drop in bathtubs have created a sensation among the health and fitness enthusiasts. 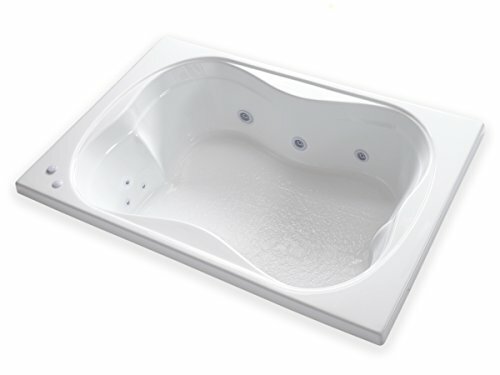 The design and construction of the models offer unique number of jets, tub dimension, water heater and sanitizer, draining mechanism, air speed controller and headrests. All of them are constructed to provide maximum healing effects on your body’s reflexology zones from the brain to the tip of your toes. The key benefits you can expect from these tubs are free circulation, oxygen volume enhancement, joint healing, increased flexibility, spinal cord stress relief, lumbar area healing etc. 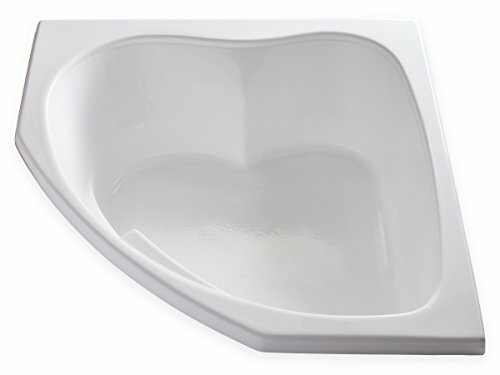 This technical article describes 6 top models of Carver bathtubs with reference to technical and functional specifications and stated benefits for your brain and body. Jet System: The Carver SKC5555 works on 6 unique jets that are spaced and installed according to the location of the key stimulation points in your body. They can blow the water and air jets at 4 varying pressure and flow rate based on the settings you make at the motor.Relaxation of the muscular and central nervous system can heal physical stress, joint pain, anxiety, muscular sprains and many of the orthopedic problems like arthritis, spinal cord problems, frozen shoulder etc. 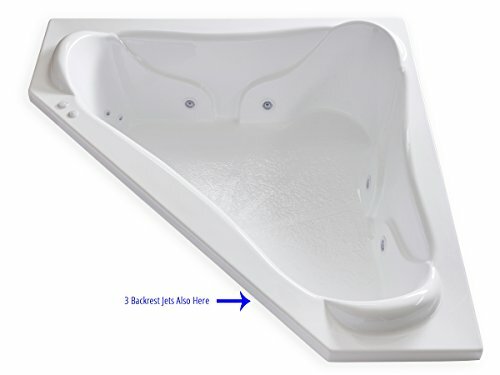 Tub Motor: The 3-speed 1.5HP Whirlpool motor works at four different blow speeds to varying heights and lengths across the tub. The UL tested pump motor works at volts of power supply to give you a maximum of 115 gallons per minute (GPM) flow rate. The extendible cord length makes the connectivity to the power source simple and safe. Tub Heater: The inbuilt heater works in conjunction with the tub motor to regulate the temperature of the hot water from the minimum to the maximum values. The inline layout can heat the tub water evenly all over the length X width X depth. The construction mechanism of the heater ensures consistent heating over extended time at the same level of efficiency. 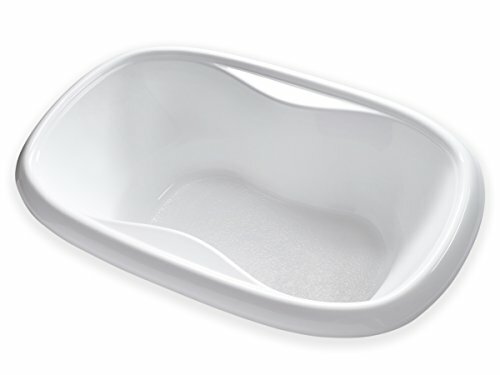 Tub Design: The Carver SKC5555 has a dimension of 55” X 55” X 18.5”, spacious enough for a single person to stretch and relax in the most comfortable posture and head rest. The slip-free bottom eliminates the risks of accidental drowning and slipping while standing. Made from acrylic material with a net weight of 175 pounds, the tub can support multiple times its weight of water volume and body weight of the individual. The self draining system and the compact dimension are designed to save on water while bathing and discharging. Jet Control: The jet and motor control switches are easily accessible by hand as they are installed on the rim of the tub where you rest your head. Spa Benefits: Besides providing the healing effects to your mind and body, the Carver SKC5555 gives you the unique benefit of energizing your reflexology centers for enhanced muscular and nervous fitness levels. Consistent massaging of the skin and Detox of the pores can heal many of the disorders like acne, eczema, skin rashes dry skin etc. Jet System: The 12 unique whirlpool jets installation height from the tub floor makes them highly convenient for the individuals of various height and weight to get the comprehensive benefits of the jet pressure all over the body.The number combination and the positioning shape (triangular on the back rests and horizontal on the side walls) make it ideal for the spinal card massage and body massage therapy efficiency. Consistent pressure and flow rate at a specific setting can give a hot massage to the joints, skin layers and the key reflexology points in your body from the head to the toe. Tub Motor: The 3 speed 1.5HP whirlpool right hand pump motor works at a power supply of 120 volts from the corded power supply. The maximum flow rate of 115GPM is designed to apply equal pressure from the multiple corners of the tub. The volume of water and the bubbles in the tub can exert high pressure massage effects at variable temperature. Ozone Sanitizer: The Carver CK5959 comes equipped with an additional feature of ozone sanitizer, which destroys every type bacteria, germs, infectious viruses and other microbial organisms. You can experience a truly hygienic bath and spa as the sanitization is effective for the water and your body equally. Hence, you can expect immunity from many of the Infectious conditions that may affect your skin and body. 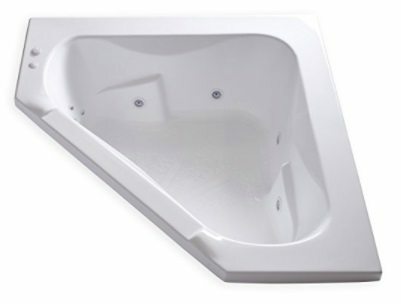 Tub Design: The Carver CK5959 has an extra dimension of 59” X 59” X 20.5” for extra body space and depth. You can immerse your body completely to experience the healing and energizing effects. At the same time the acrylic material with a slip-free bottom protect you from accidental slip and drown risks. The tub weight of 175 pounds can carry large volume of water and individual body weight of any size. Jet Control: Two easy buttons on the rims (near backrest) for the jets and the pump motor help in controlling the pressure, flow rate and temperature according to your need. Spa Benefits: The extra space and the sanitizing effects enhance your spa experience higher than the massaging and healing. The immunized water particulates injected into the skin pores can eliminate all the bacterial and germ deposits on your skin. The ozone treated water molecules have the capacity to detox the skin to the dermis layer. It can restore the alkaline conditions and moisture levels of your skin, making it youthful and free from aging signs. Jet System: The 12 jet sprayers with a combined flow rate of 115 GPM are positioned on the four walls of the tub with 6 of them on the backrest position. High pressure jet on the lower and upper back position of the spinal cord can rejuvenate your entire body muscles, nervous system, blood vessels and the internal organs, including the skin.By positioning the maximum number of jets at the backrest position, the designers have ensured comprehensive massaging effects within the shortest time. 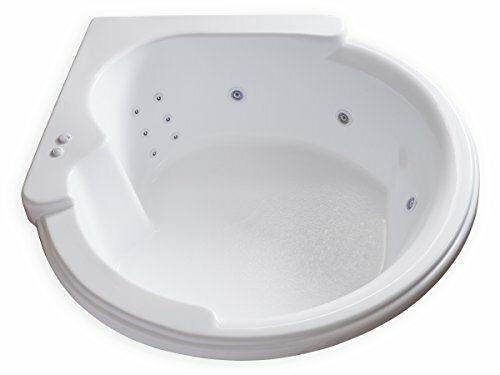 The “U” shape of the jets at the back rest and “O” shape on the sides are designed to regulate the spa massage effects within the controlled temperature zone of the tub. Tub Motor: The 5HP whirlpool pump motor works at 120 volts of corded power supply. Since the Carver ME6060 doesn’t have an inbuilt heater, you may have to add an inline heater if you wish to enjoy the benefits of hot water. Ozone Sanitizer: The active ozone sanitizer on the Carver ME6060 is designed to kill more than 99.5% of the bacteria, fungi, viruses and germs from the water. The ozone irradiated water has many medical properties for Detox, deep cleanse, de-clog and destruction of resident microbes and germs in your skin and pores. You can expect the system to balance the hygienic water ingredients with dissolved minerals for healthier skin and body. 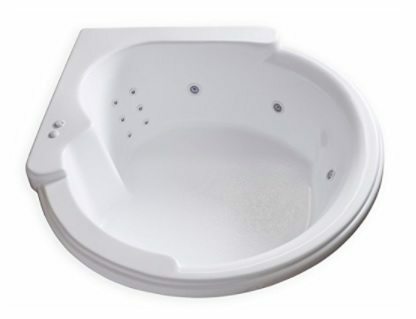 Tub Design: The Extra large dimension of 60” X 60” X 19” Carver ME6060 can accommodate an individual having larger body size and heavy weight easily. Pure acrylic material with a net weight of 175 pounds is built with load bearing and long lasting construction. Slip free bottom, optimum depth and perfect body shape having convenient head rest and twin hand rests make it ideal for luxury bath and spa lovers. Jet Control: The jet and motor control buttons are easily accessible at the left hand rim. Since the heater is not a part of the inbuilt mechanism, you may have to add another switch for controlling the functionality of the external inline heater when you install it. 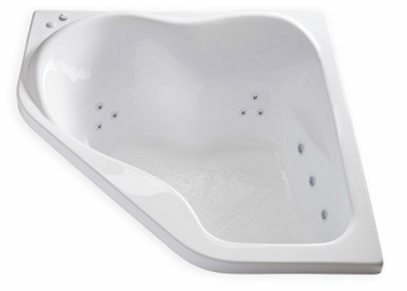 Installable Jets: Being a soaking bathtub, the Carver JT5959 has no inbuilt jets. But you can customize the jet installation from the manufactures, who offer air jet and water-jet models.However, you need to purchase them separately and ask your plumber to install them at convenient locations external to the tub construction. The tub also doesn’t have an inbuilt heater. Hence, you may have to install the inline heater as an additional feature. On the other hand, you may simply add a faucet and connect it to the external water heater that can supply the required water volume at desired temperature. Soaking System: The deep soaking design with fiberglass coated body keeps the temperature at constant levels over an extended period. 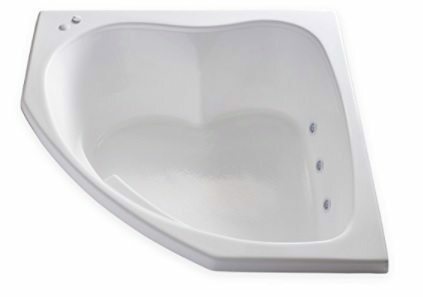 The thermal insulation property of the Carver JT5959 body prevents the heat loss from the tub. Efficiently. You can add essential oils or Epsom salt to increase the energizing and deep massaging property of the water. 15 to 20 minutes of soaking should give you the desired effects of skin pore cleaning, skin Detox, moisturizing effects, body ph balance ad and the healing effects for skin infections. You can also add external faucets and handheld shower jets to enhance the experience of hot water massage. 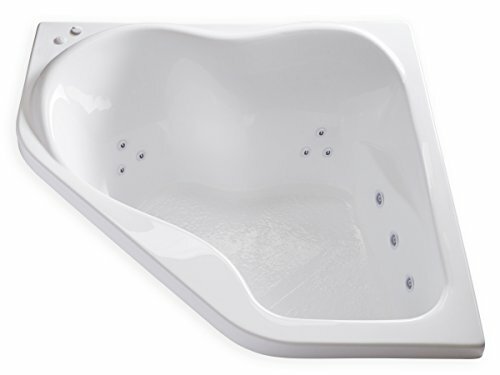 Tub Design: With a dimension of 59” X 59” X 21.5”, the Carver JT5959 is moderate in its length and width parameters. But it has a greater depth of 21.5” which is sufficient for deep soaking of the skin over an extended time. Once you get into the bath tub with moderate to high temperature, you can easily stretch and rest your body from the three comfortable head rests. The contour of the tub’s interior is designed to fit in moderate to heavy sized individual with relative ease. If you plan to use the Carver JT5959 for your children’s bathroom, the safety features of slip free bottom and sturdy construction should make it ideal. The design of the rims and the interior edges of the bath tub provide a firm hand support for you to get in and out of the tub safely. Spa Effects: If you really wish to enjoy the true benefits of the spa along with the deep soaking effects, you may want to install the external faucets or jets. Apart from that, you can also enjoy the spa benefits to a limited extent by using the bathtub at moderate temperature water and mixing of energizing salts. Jet System: The installation positions of the 12 jets on the internal tub walls plays a key role in enhancing the spa effects at optimum pressure and temperature. The six high pressure jets on the back rest location of the Carver CW6464 provides consistent flow rate of 115GPM to massage the spinal cord and the backbone.You can experience the relaxation of the central nervous system from the sacral sine, lumbar spine, thoracic spine and the cervical spine. This sort of massage can help in relieving the lower back ache, neck ache and the ventral root. Since the sensory and motor nerves get stimulated by the hot water spray, the transmission of the signals improves significantly. The responsive characteristics of the nervous system improve significantly with time. The muscle stimulating jets around the bathtub can help improve the relaxation and flexibility of the major and minor muscles and connecting tissues. Tub Motor: The 5HP whirlpool motor pumps the water at a maximum net rate of 115GPM and works of 120 volts power supply from corded electric system. The speed-dial settings on the motor can help in changing the pressure and water flow rate below the maximum value according to your convenience. The location of the motor beneath the bathtub structure ensures complete isolation from the water and steam generated from the tub water. Ozone Sanitizer: The inlay of the ozone sanitizer helps in removing the germs, viruses and bacteria from the water completely. The result is vast improvement in the skin health body hygiene and health. The ozone irradiated water has special healing properties which can reduce many of the conditions that may lead to the growth of acne, eczema, skin spots and other disorders. Deep cleaning of the skin pores and the detox help in rejuvenating the skin cells and tissues on the epidermis and the dermis layers. Tub Heater: The inbuilt water heater has the ability to heat the water to varying temperatures as set by the controller. The key feature of the Carver CW6464 heater is to sustain the heating process evenly all over the tub. Tub Design: The unique tub design of the carver CW6464 helps in providing sufficient back rest and arm support. The 64” X 64” X 21” dimension provides sufficient length, width and depth for complete rinsing of tour body. Practical tests have revealed the benefit of the soaking effects to the adults with larger than normal size body as well as the children and adolescents. Safety is one of the critical elements of the carver CW6464. 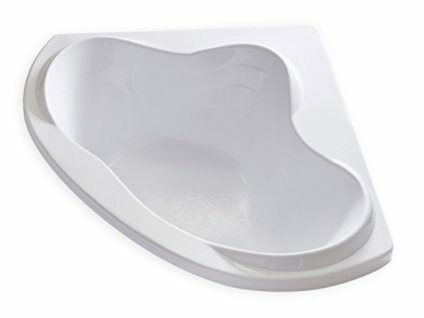 Slip free bottom with adequate support for the arms and shoulders make the tub highly preferred for all age groups and people with limited physical abilities. The enhanced depth of the tub can increase the soaking effects of the ozone treated water for the skin, which heals the many types of skin infection symptoms. Jet Control: The easily accessible (to the right hand ) switches on the bathtub rim help in controlling the temperature, pressure and the flow rate of the in-flowing and jet water. Spa Benefits: The spa benefits of the Carver CW6464 can be experienced by the focus of the jet water onto the specific body parts. Rotating elements within the jets can direct the flow of high pressure water onto the muscles, skin and the joints very easily. Changing your body and head resting positions can expose your entire body to the jet water at your convenience. The relaxation of the joints can significantly reduce the conditions of joint pain, muscle spasm, nervous stress and unrest in the cardiovascular system. Jet System: The layout of the jet system is entirely different in the Carver CT6060 bath tub. The interior design of the tub walls is split into several sections onto which every jet is installed. The rotating inner section of the jets makes it possible to change the direction of pressure water flow.The even distribution of the jets makes it possible to get consistent pressure spraying all over your body. You can experience the reflexology zones massaging of the body at various rates of flow and temperatures. Tub Motor: The 1.5HP motor works at 120 volts and regulates the flow rate to a maximum of 115GPM. The speed dial switch on the rims of the tub allows you to vary the value within the maximum. Ozone Sanitizer: The inbuilt ozone sanitizer has the ability to destroy more than 99.5 % of the bacteria and germs from the water. The ozone treated water molecules can enhance the skin immunity and improve the healing effects of the skin infection symptoms. Moisturizing and energizing properties of the water in the tub can relieve the stress and physical fatigue you experience at the end of the day. Tub Heater: An inbuilt heater heats the water to the maximum value set by the controller. The power supply from the corded system is efficiently utilized by The Carver CT6060 heater. Tub Design: The tub dimension of 60” X 60” X 60” with a perfectly shaped head rest and arm rests makes it possible to stretch your body comfortably. The depth of the tub makes it possible to have deep soaking effects of the hot water on your skin and muscles. Spa Effects: The spa effects of the hot water heal most of the orthopedic, joint and muscular pains and stress factors naturally. 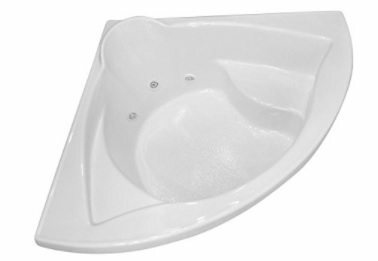 With this assortment of Carver drop in tubs you will be able to find the corner jacuzzi tub to your liking. Our carver tubs reviews is only a partial look at the Carver tubs available. Feel free to go to Amazon for more selections. and learn more about one of the best corner bathtub manufacturers.